Google has announced Google Maps 5.7 for Android, bringing a version of its turn-by-turn Navigation service for public transport routes. Google Maps Transit Navigation brings detailed public transport information for over 400 cities around the world, allowing you to plan your journey more effectively. 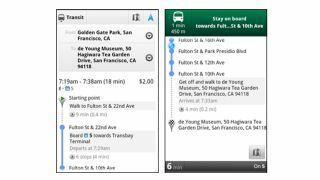 Instead of turn-by-turn directions, Transit Navigation offers a stop-by-stop service, making it easier for users traveling in foreign countries to keep track on their journey. The new functionality also supports multi-tasking so if you leave the app, you'll get a notification telling you to get off at the next stop or when to transfer to a different train. As well as Transit Navigation, Google has added improvements to the driving and walking aspects of the app and has tweaked the search aspect in order to identify target destinations more easily. You can also look at the photos for Places in more detail using the 5.7 updated.You can read about this and the rest of the updates in more detail on the Official Google Blog. Naturally, the app is still free to all Android users and should download automatically to your handset.